I was pleasantly surprised the other week, when I went to my LinkedIn company page to find that I was given an option to access the new admin experience and view the new company page layout. We know that LinkedIn is in the process of rolling out some major changes to the look & feel of LinkedIn on the desktop and it seems that company pages are also getting a re-vamp. At this moment, we just don’t know when. But why have a company page? 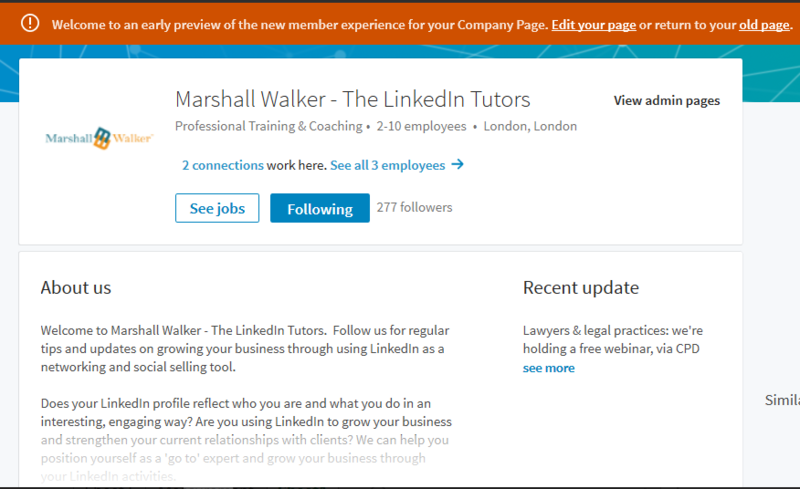 At Marshall Walker – The LinkedIn Tutors, we are often asked about the value of having a company page. Often your focus is more on your personal LinkedIn profile but there are some key benefits to having a company page, plus they are not too difficult to create. Forge relationships: Having a company page allows you to attract followers, and build a community to help drive engagement. According to LinkedIn, 80% of LinkedIn users want to connect with companies; at the same time, almost 50% are more likely to buy from a company they engage with on LinkedIn. Branding: LinkedIn company pages are great for branding. You can add your logo and banner image. The banner image that appears on your company page can include your company’s website URL, a call to action or tag line to make it easy for people to find you outside of LinkedIn and encourage engagement. You could also rotate your banner images especially if you are running a campaign or have an upcoming event. Company page status updates are great for important announcements and of course for gaining valuable insights on how your content is performing. Plus, you can connect your personal LinkedIn profile to the company page, which adds the company logo to your LinkedIn profile. It gets you found on Google! treat your LinkedIn company page as another website for you and your business. And we know that Google loves LinkedIn so using keywords on your company page improves search visibility on Google, making you even easier to find. Let’s take a look at the changes . . .
Click on “access the new admin experience” and it takes you to an early preview of the new company page admin experience. I have to admit I like the new layout – it looks much cleaner compared to the current version. 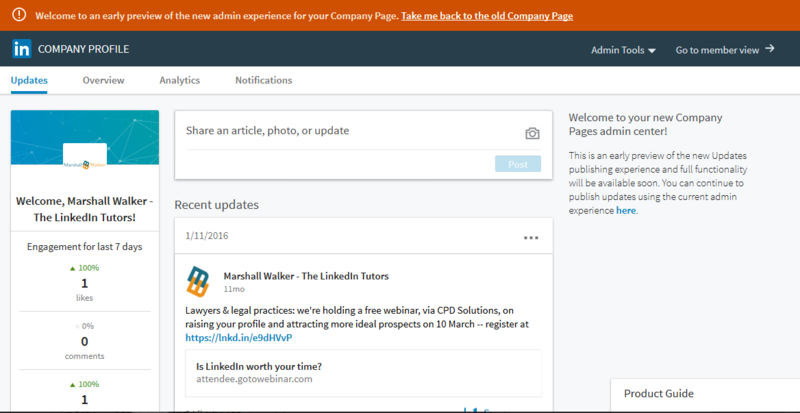 Updates: when you go to Admin section of your company page, the first page is the Updates section where you can post new updates, target followers, pin updates to the top and get an overview of how well your updates have been doing in terms of engagement. However, what’s new and a huge improvement is that that you can now upload images which you can’t do on the current company page status update. At the same time if you preview the company page layout you will see that the company page updates are shorter – in the same way as home page status updates – so instead of seeing the whole update as you do currently, you will see the update is truncated and you must click on “. . . see more” to see more! Overview: aka ‘edit mode’ is where you can edit the content on your company page such as the About us section, and upload a new banner image. The header /banner image has changed in size and is now 1536 x 768 pixels compared to 646 x 220 pixels in the current version. However, my old header banner seems to have worked well and you can drag the image to position it. In fact, I think it looks a lot better as the image goes across the top of the screen – very much in the same way as the background image on your LinkedIn profile. Analytics: as before you get some good insights into how well your company page updates are performing, including the number of impressions, clicks and interactions. Notifications: again you can see the interaction with your content – the likes, shares and comments, etc. Currently ‘Analytics’ and ‘Notifications’ take you the current admin view of your company page, but what I like is the fact is that these menu options are now listed across the top of the page. Currently if you want to update your company page you have to click on “Edit” and the select “Edit page” from the drop down, so the new layout just makes the whole process cleaner and easier. As well as the back-end admin section, the member or user view has also been updated. Again, a nice clean layout. What you notice is that the “how you’re connected” section has moved from the side bar in to the top header section. Here you can still see how many connections you have as well as seeing all employees who have their profiles linked to the company page. I am sure there will be more changes to come but so far I think the company page updates are looking good so I await the new company page updates with anticipation! By: Judy Parsons, LinkedIn Trainer at Marshall Walker – The LinkedIn Tutors.